Low – carb, low calorie, protein packed recipe that taste amazing & will leave you satisfied! We honestly felt as if we were having a cheat meal:) This quick, easy to get ingredient recipe – takes about 10 to 15 minutes to make and can be easily adjusted based on the amount of people you’re feeding. 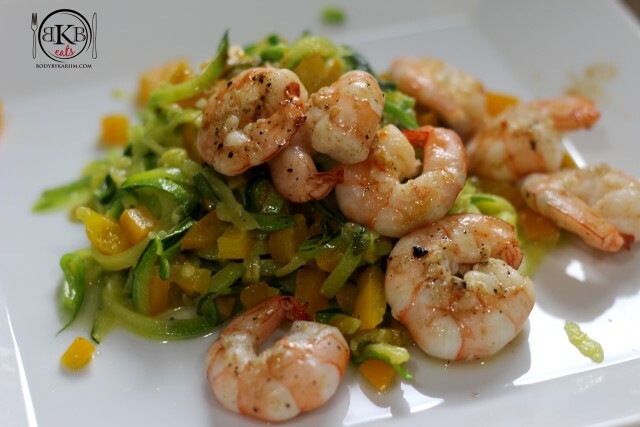 Slice thin strips of zucchini with a spiralizer or vegetable peeler to make the noodles. Heat non stick sauce pan over medium high heat add 1 tablespoon of grape seed oil or olive oil. Once the pan is hot, add chopped bell peppers and jalapeño. Sauté for 1 minute then add zucchini. Cook for 2 minutes. Push all ingredients to one side of the pan then add shrimp. *Note: if your pan is full of noodles, please use a separate pan to sauté or grill shrimp. Mix in goat cheese over all ingredients in the pan and stir until melted. Plate and Serve (top with parmesan). This is amazing!!! Great tasting and so easy to make!